mHealth solutions, also known as health & fitness apps, represent a very important approach to solve the big demographic and health care problems that are constantly rising: Ageing population, increasing number of chronic diseases and health care systems that are not able to keep track. mHealth apps help people to prevent health issues, stay healthy and manage health problems. But in the long term, mHealth solutions have only than relevance to the user if it is tailored to each of them individually and can help them manage their health. 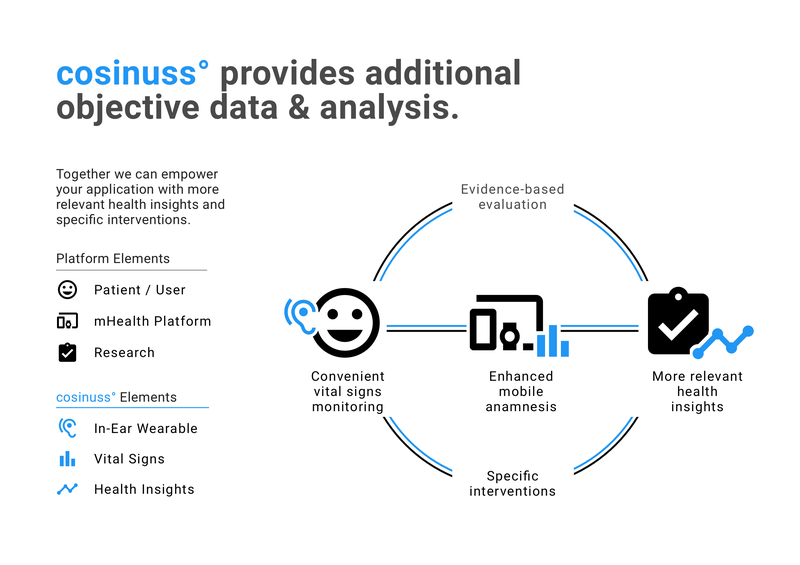 Just like a physician in a hospital will examine a patient starting from personal history and continuous readings to outside symptoms in order to create crucial insights about the patient´s health, cosinuss° does the same with one single device and algorithms every time and anywhere you want it. – Now what is their individual “normal” health status. – See changes in their normal health status. – Get the chance to take ownership of their health. Interested in adding more relevance to mHealth? Find out more about cosinuss° technology and how it can be easily integrated into any solution.